How to evaluate Abe’s August 15 statement on the 70th anniversary of Japan’s defeat in World War II. This article is part of The Diplomat’s series exploring historical issues in Northeast Asia and Japanese Prime Minister Shinzo Abe’s statement on the 70th anniversary of the end of World War II. See the rest of the series here. The statement delivered on August 14 by Japanese Prime Minister Shinzo Abe — on the 70th anniversary of Japan’s defeat in World War II — produced a sensation at home and abroad. In Japan, it received a favorable reputation and the reported Cabinet approval rating, which had dropped due to the new security bills, recovered somewhat. Although some keep criticizing the prime minister for not apologizing sincerely and for the indirect wording used in the apology in the statement, the criticism that Abe is a revisionist will be diminished after this statement. However, because this statement got serious political attention and was made as a result of international coordination, it could not avoid causing objections from both the political right and left. Although the government intended to show a new historical perspective as a consensus of Japanese society and close the historical problem, it became clear that historical views in Japan were divided. The statement on the 70th anniversary of Japan’s defeat is based on past statement – for example the statement by then-Prime Minister Tomiichi Murayama in 1995. In addition, the Abe statement also consulted the report of a panel commission that was composed of professors of history and political science as well as business leaders. The prime minister created this panel to reconsider “the history of the 20th century and Japan’s role and the world order in the 21st century.” It is also important that this statement referred to Abe’s speeches in recent years. Expressions like “repentance” or “remorse” would be incorporated according to the evaluation of previous speeches he made in the United States or Australia. Japanese media made a “score” right after the idea of the statement was announced. The media did the agenda setting, and placed an emphasis on whether the prime minister would use the words “aggression” or “colonial rule” and express his feelings of “deep remorse” and “apology” to victims. The fundamental purposes of the panel and Abe statement were to design the view of 21st century, in the context of Japan’s aim of reconciliation and international contributions in the 70 years since World War II. But the agenda setting of the mass media spread to society at large and the government could not ignore this issue. Compared to this apology, the apology of the Abe statement — “Japan has repeatedly expressed the feelings of deep remorse and heartfelt apology for its actions during the war” — did not make it clear which historical perspective he personally holds. However, this statement was decided in the Cabinet and it demonstrated the official position of Abe’s Cabinet. The thrust of the statement was to explain that Japan contributed to the world order after World War II for these 70 years and supported the international trade regime. The statement sought to argue that policies like the security bills which passed Japan’s lower house last month or the Trans-Pacific Partnership are historically reasonable. Besides, the point that Japan was a peaceful state that has tried to reconcile with neighboring countries was also significant. Next, there’s the historical perspective in the Abe statement. The Murayama statement could be read as apologizing for all Japanese aggression and colonial rule, not just those of a specific time period. On the other hand, the Abe 70th anniversary statement asserted that Japan did not follow the international trend for peace and anti-colonialism in the late 1920s and after the Manchurian incident in 1931. This perspective is contradictory to that of China and Korea. Especially Korea, which was annexed by Japan in 1910, strongly opposed this view. However, from the viewpoint of international history, it is not that inappropriate to see Japan as deviating from the world order in the late 1920s. In addition, Abe’s words about the end of Japan’s “apology” also caused much controversy. He said that his generation must not let the next generations “be predestined to apologize.” This is not satisfactory for those who would like to see the Japanese apologize for generations for the “sin of Japanese ethnicity.” It was also problematic that Abe referred to the end of the “apology” even though there is still no reconciliation in East Asia. But it could be easily understood this expression followed the famous speech of former German President Richard von Weizsäcker in 1985 on the 40th anniversary of the end of the World War II in Europe. It also could be said that the thankful expression for countries and people who reconciled with Japan paralleled the statement of German Chancellor Angela Merkel. In this sense, the Abe statement tended to be based on global standards about responsibility for war. However, one should not forget the situations in Europe and East Asia are totally different. The last point is this statement was released in different languages (Japanese, English, Mandarin, Korean). 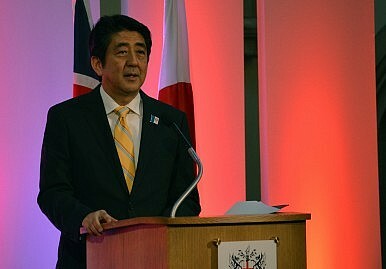 The Abe statement should be understood as a sum of multilingual writings. One should be careful to note that the impression could be different according to each translation. Because this statement contained various political intentions and expectations, the agenda setting by the mass media to evaluate the statement preceded deliberative discussion in Japanese society. Therefore the government must explain not only each expression, but also the intention and definitive interpretation, including those for each different translation. Otherwise misreading, misunderstanding, and wrong interpretations will be spread all over the world. Shin Kawashima is Editor in chief of Nippon.com, professor of international relations at the University of Tokyo, and senior researcher at the Institute for International Policy Studies. This piece was translated from Japanese by Asako Takashima. The Abe Statement: Did Abe Apologize?Why You Should Listen to What Japan's Emperor Says on August 15Abe’s 70th Anniversary Statement: What Should We Expect?Twitter Says: South Koreans Not Satisfied with Abe’s SpeechShould the United States Be Blamed for Japan’s Historical Revisionism?